Should have been brought on for mata or lingard at HT, for some reason he just looks like someone who will link mid and attack together. He really deserves more than 15 minutes in a mess of a match. He looks no worse than any of the other so called first team players, I think he should get a start soon. Needs to be given a full 90 minutes in his best position as the striker. Scraps are all he'll get at this stage of the season when we still have things to play for. With a full pre-season with the first team he'll get plenty of chances. Performing really well at u23 but still waiting for him to shine when called upon. That usually where some of our first team-players free kicks end up. Technically brilliant with either foot and has a footballing brain to match. I have high hopes for him..
Mate, this is the caf. Patience is not in the dictionary. WTF is he doing playing a reserve game instead of traveling to Barca? "Sources have told ESPN FC that his technical ability is beyond anything many of United's age-group coaches have ever seen before in a player his age. He can take corners, free kicks and penalties with both feet so well that it's hard to decipher which is his strongest side"
Article by Rob Dawson on when Mason was selected for the pre-season tour at 16. Thought I'd share for anyone interested..
To think that this season alone he’s also scored free-kicks with his right foot. He's scored 3 freekicks this season. Two with his right and the latest one with his left. 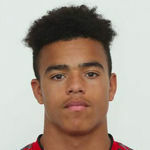 Isn’t Greenwood putting up Messi like numbers in the academy? He’s scores a goal per game and an assist every other game which is insanity. Imagine not thinking much of that. ...I can easily see Greenwood taking over upfront from/with Martial down the road. Being the backup option or possibly even take over since Martial hasn’t really cemented any sort of consistency despite being as talented as he is. I can't remember us having a striker with Mason's potential coming through the ranks since God knows when. So it's only natural for people to get excited over his undoubted potential. His scoring rate is phenomenal for a 17 year old and people want to see us have a deadly striker once again. It will take two season before he can be a regular. He will come on in Cup matches. Perhaps even start against lesser opponents. If he keeps working hard and listens to Ole and Phelan, he will be an immense player for us for many years. Lovely goal. The technique there is reminiscent of van Persie. I take it he's not in the squad against Barca? Weird decision not to take him. I’ll say it again. Reminds me so much of RvP. Let's hope he's not another James Wilson then. Wilson was one dimensional. Had pace but the rest of his game wasn't of the required standard.. Never understood the fuss personally. So far, Ole seems hesitant to play the kids ahead of established players. Let's be honest Mason is better than what both Rashford and Martial are putting out at the moment. If Ole treats the players as their friend instead of Boss he will fail. No other top manager does that. I love Ole but I cringe when he refers to Rashford as Rashers in press conferences and stuff. He's going to have to stamp his authority over them otherwise they'll run right over him. He's scored two with his weaker foot.. But I thought Mourinho was the evil kid-killer while Ole is the one with true United DNA who would give talented kids fair chances. But why is Greenwood not on that plane to Barcelona? Because it’s the business end of the season. And by all rights we have no business being in this tie in the first place never mind a goal away from possibly progressing to the semis. Just as we should be nowhere near top four. It’s understandable that Ole is being pragmatic considering the short time he’s been in the job. If the same trend continues next season then a moan might be justified. But not now. His finishing indeed was very good in addition to the pace. I thought he had a good chance too. Doesn't say much for my eye but I still would say Greenwood is much better particularly dribbling and passing. That thump, amazing how loud it was.